Is it Possible to Record Netflix with Free Capture Software? Yes – But You May Not Like the Result. Netflix uses Microsoft’s sophisticated Silverlight streaming video process to deliver video to your desktop. You can’t capture the stream directly but you can record Netflix as it plays using screen capture software. There are a number of free or open source applications to record screen video. They do a decent utilitarian job of capturing what’s playing on your screen and through your speakers but don’t expect anything more. They don’t support a wide range of file formats to save the capture to and few, if any, resolution conversion options. Being able to convert to different file formats and resolutions is critical if you want to play what you’ve recorded on media players, media phones, and other portable devices. If you still want to give the free screen recording software a try I’d recommend CamStudio. It’s primarily used to capture desktop presentations so it’s challenged by full-motion video and high-quality sound. A good-quality solution that does a great job of capturing screen video. Limited conversion options. 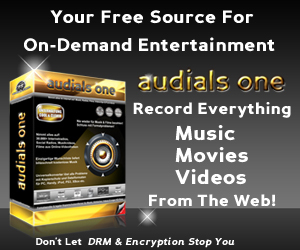 An excellent high-quality, full-featured solution – find, record, download, convert & enjoy music, movies, videos, podcasts & radio stations. (Another sidenote: I tried the Audials One demo and purchased the full version the next day. It’s the most full-featured “gotta have it” solution if you want to capture and convert video or music. It’s awesome and does cool things you don’t even know you NEED yet!!! The interface is gorgeous and intuitive too!